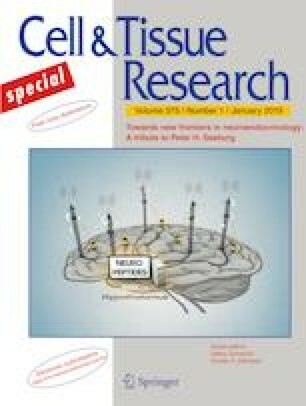 We examine evolutionary aspects of two primordial neuropeptides, arginine vasopressin (AVP) and pituitary adenylate cyclase-activating polypeptide (PACAP); the distribution of AVP and PACAP and their receptors in mammals; AVP and PACAP release patterns relevant to their roles in neuroendocrine control in brain and periphery; and finally the intricate interlocking of homeostatic and allostatic regulation created by extrahypothalamic AVP and PACAP projections to brain circuit nodes important in controlling appetitive, avoidance and aggressive motor responses. A cardinal feature of peptide neurotransmission important in regulatory control of organismic responses and emphasized in this review, is that neuropeptides are released from large dense-core vesicles docked not only within axonal varicosities and dendrites but also at presynaptic nerve terminal sites, along with small clear synaptic vesicles, at active zones. Peptide transmitter nerve terminals, from hypothalamic and other projections, are distributed widely to multiple brain areas important in integrative control of behavior. They converge with heterologous inputs that release other transmitters, including other peptides, in the same areas. The concept of a quasi-hormonal effect of peptide neurotransmission through coordinated release at multiple synapses throughout the brain echoes earlier conceptualizations of “action-at-a-distance” by diffusion following peptide release at non-synaptic sites. Yet, it recognizes that peptide delivery occurs with neuroanatomical precision, from discrete peptide-containing brain nuclei, via highly distributed projections to multiple extrahypothalamic nodes, registering multiple homeostatic, hedonistic, aversive and reproductive drives that modulate real-time motor decisions. There is paradigmatic value in the discussion of these two particular ancient neuropeptides, for peptide-centric translational neuroendocrinology and peptide GPCR-based neurotherapeutics. We thank Vito Hernández for critical reading of the manuscript and Fernando Jáuregui for assistance in Fig. 3 preparation. This work was supported by DGAPA-UNAM-PAPIIT-IN216918, CONACYT-CB-238744 (to L.Z.) and NIMH-IRP-MH002386 (to L.E.E.). L.Z. was a Fulbright Visiting Scholar in the Section on Molecular Neuroscience during the initial stages of preparation of this review and was also supported by PASPA-DGAPA-UNAM fellowships for her sabbatical leave.